Most people associate Stockholm Syndrome, a situation in which people being held captive feel sympathy toward their captors, with Patty Hearst and her ordeal with the Symbionese Liberation Army in 1974. But the term Stockholm Syndrome was actually coined a year before in—you guessed it—Sweden. The whole thing went down over a period of six days, from August 23 through August 28, 1973. On the first day, Jan-Erik Olsson strolled into Kreditbanken in central Stockholm, Sweden, and single-handedly held the place up. Of the two policemen who responded to the call, Olsson shot one in the hand and made the other sit in a chair, ordering him to sing something. (The policeman chose “Lonesome Cowboy,” in case you’re interested.) Olsson then took four hostages and started making demands: He wanted his friend and expert bank robber Clark Olofsson brought to the bank. He wanted 3 million Swedish Kronor. And he wanted a couple of guns, some bulletproof vests, some helmets, and a fast car. His friend was delivered. 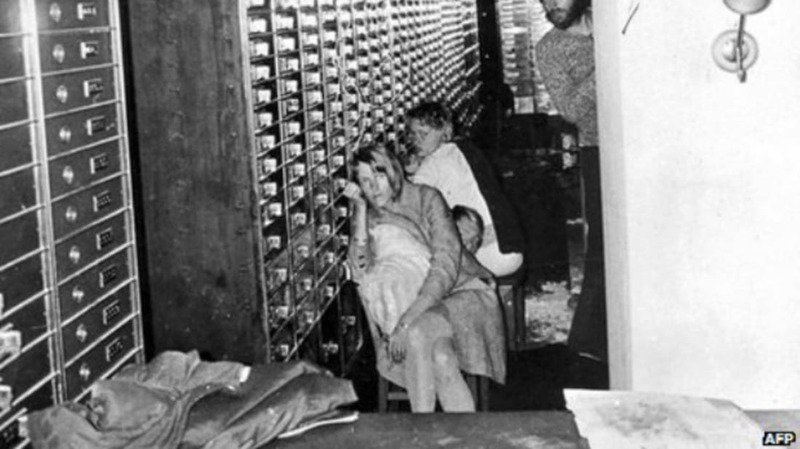 While they waited for the other items and planned their escape over the course of the next few days, the bank-robbing duo kept their captives locked inside of the bank vault. They had a few phone exchanges with Prime Minister Olof Palme, including one where they allowed hostage Kristin Ehnemark to speak. It was during this phone call that it became clear that the hostages were starting to sympathize with their captors. Ehnemark told the Prime Minister, “I think you are sitting there playing chequers with our lives. I fully trust Clark and the robber. I am not desperate. They haven't done a thing to us. On the contrary, they have been very nice. But you know, Olof, what I'm scared of is that the police will attack and cause us to die." Other hostages turned sympathetic as well, later saying that they thought Olofsson and Olsson were perfectly lovely. One claustrophobic expressed gratitude that the men allowed her to leave the vault as long as she had a rope tied around her neck like a dog, and another hostage who was told he was going to be shot was grateful that Olsson was going to let him get drunk first. On August 28, police finally decided to gas everyone out via a hole they had drilled through the ceiling of the bank vault. The ploy worked, and everyone eventually left the bank unharmed. Both Olofsson and Olsson were captured. Olsson received 10 years in prison and has had a spotless record ever since. Olofsson, on the other hand, was released after appealing his sentence, managing to convince a judge that he had only showed up at the scene of the crime to help ensure the safety of the hostages. He became friendly with his captives over the years, even getting chummy with Ehnemark’s whole family when he wasn’t in and out of prison on various charges for the next few decades. Some reports say that each captor even eventually married two of their hostages. While that’s not true, Olsson did marry one of the many women he corresponded with while in prison—apparently his hostages weren’t the only ones in whom he inspired sympathy. Why would such a thing happen, though? How could anyone feel sympathy for their would-be murderers to the point that they would befriend them? There are a lot of steps in the process, but one of them is a psychological survival tactic: To make the situation less stressful and more manageable, the captive comes to believe that the captor is their friend, that he or she is a good person deep down, and they can get out of this predicament together.